I have scoured the internet and state archives. I am in need of locating this Oak(s) Branch off of Moon Creek in Caswell County, North Carolina. Attached is the original survey map. I have trolled Google Earth and beyond and I am having difficulty locating it. I don't think this helps much, but looking at the image on nclandgrants.com I think the other name is "Niman Harrison" rather than "Ninian". Unfortunately nclandgrants doesn't have a grant for either name. "BEARING OBJECT – (PLSS)- A corner accessory which may be a natural object that can be readily identified by its distance and direction from the corner being recorded." So, some mark or other that was semi-permanent? I'm not a surveyor. I think it could just be a mark in a tree. Nclandgrants has another entry for Oakes Branch: John Oakes for 100 acres "On Oakes branch a water of Moons Creek"
Sounds like that's the origin of the creek name. Unfortunately the patent doc doesn't offer any more clues, except that it's next to Samuel Paul's land, which we knew already. The survey docs might help if they're available. Also note there are two branches to Moon Creek - between them they cover a lot of area. Inferring father/son relationships from Senior (Sr.) / Junior (Jr.) naming? 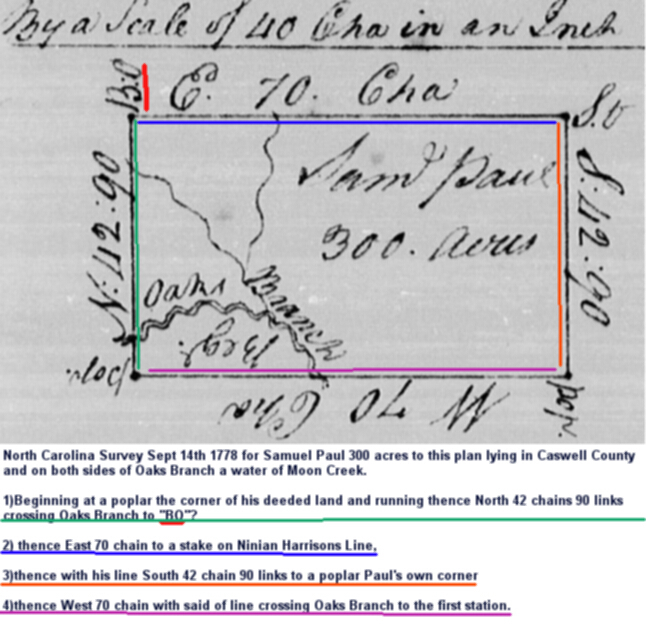 Finding birth/baptism record (ca 1812) for Charles H. Cox born in North Carolina? Finding records for indentured servants in South Carolina? Where was Berditoscher, Russia in 1912?